Railpictures.ca - Stephen C. Host Photo: Give me all you got the head end of CP 142-06 says to the crew of “work CP 3097, TH11-07″, attached at the rear of the intermodal train. Almost like planned clockwork, 142 and TH11 danced into the CTC at Desjardins, both receiving work clearances between Desjardins and begin/end sign CTC Guelph Junction, the pusher set given a protect against Work CP 6049, and off they go up the hill. The head end crew radios instructions to the tail end crew matching notches as the track profile warrants. Bang, Bang, Bang – the slack has given out as the tail end reduces to idle — predictably the train is quickly slowing. Head end says to tail end crew “we’ve passed the bridge, ok to apply throttle” and within 15 seconds similar bangs are heard as the slack bunches back in. Train speed is barely increasing, and one last instruction over the radio is heard “give me all you got!”. In a few moments any chirping of the radio is no longer audible as three geeps giving all they got pass me in a puff of smoke as I snap a couple photos. 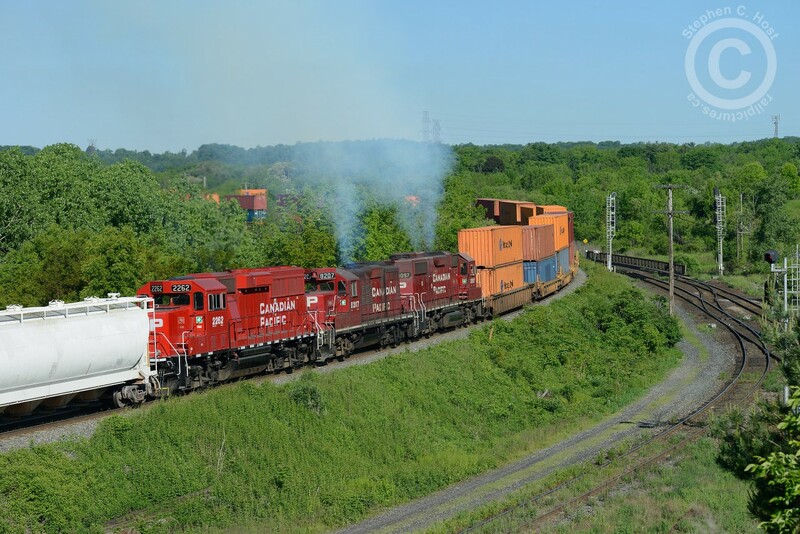 The car at rear is for TH11 to set-off at Barnes near Waterdown, making for what at first glance looks like a real mid-train pusher set, but looks are deceiving :) | Railpictures.ca – Canadian Railway Photography – photographie ferroviaire Canadienne. Caption: Give me all you got the head end of CP 142-06 says to the crew of "work CP 3097, TH11-07", attached at the rear of the intermodal train. Almost like planned clockwork, 142 and TH11 danced into the CTC at Desjardins, both receiving work clearances between Desjardins and begin/end sign CTC Guelph Junction, the pusher set given a protect against Work CP 6049, and off they go up the hill. The head end crew radios instructions to the tail end crew matching throttle as the track profile warrants. Bang, Bang, Bang - the slack has given out as the tail end reduces to idle -- predictably the train is quickly slowing. Head end says to tail end crew "we've passed the bridge, ok to apply throttle" and within 15 seconds similar bangs are heard as the slack bunches back in. Train speed is barely increasing, and one last instruction over the radio is heard "give me all you got!". Missed him going north but caught the light power returning. Nice power consist too! Great shot. Now imagine if they were Alcos’. I bet that sounded awesome! Nicely done Mr. Host.